Mortiis' Keiser av en Dimensjon Ukjent is a journey into a fantasy world that accurately conveys the full extent of a young man's spiritual escape. 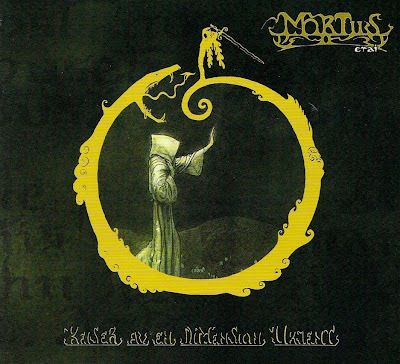 It is the most successfully realized vision of the early years of Mortiis; afterward he would go on to much shorter and more whimsical musical ideas, and after that something completely different (and much more commercial). I'd go as far as to say that this is Mortiis' most spiritual work. The theme is decay. This is clearly noticeable in the presentation of the VHS music video for the song Reisene til grotter og ødemarker, where we see prolonged images in a black-and-white landscape that change at a slow (epic?) pace in a manner matching the music, almost like a minimalist version of Koyaanisqatsi. The ideas are long and repetitive, utilizing a cheap synthesizer and the occasional amateurish choir voice by Mortiis himself. The timpani drums pound in slowly accompanied by a proud corpulent brass ensemble (by far the most noticeably cheesy instrument). The "cheese" is immensely important to the purpose of the music, the primitive quality of the sound creating an atmosphere of dank castles, removing it from all mainstream music, giving it the same "necro" feeling that would make black metal powerful, though in an entirely different quality. In Reisene til grotter og ødemarker the music is structured in two voices: one is a distant observance of the landscape, and the other is a close-up view, to the point that we see all the ugliness. This latter style is particularly interesting, sounding like the musical mind of a maniacally disturbed tyrant. We can almost imagine the eyes of such a creature, spinning about in its skull with the madness that comes from limitless power. This is the sound of decay and the sound of dungeons, an entirely unique atmosphere that you will find in no other music, and yet it is profound when it comes to its conclusions, rising out from the dungeon and up to the top of its tower, where it views the horizon of its vast and glorious kingdom. Beneath the bleak and decadent exterior, there is a beauty. This is where Mortiis is the most profound and complex. The rot on the surface hides a romantic longing for something far beyond the experience of the everyday and describable, very much like black metal, but without the angsty pimple-ridden testosterone. We can sense that this fantasy world of Mortiis has been given much thought, and is far more vast than these notes could ever convey. We sense that this is a place in which a disillusioned man has retreated into a fantasy that has gone several steps beyond escapism and into the realm of genuine spirituality. Could someone live their life as a monk, but instead of reading and thinking upon the bible in their meditations, could they fill their mind and soul with some very personal fantasy? This is the very edge of escapism that Mortiis presents to us, but few will recognize it as such. This is taking fantasy to a level of seriousness that your run-of-the-mill LARPing nerd would scoff at. This is fantasy as religion. I believe that with this and the previous two Mortiis albums, he was trying to create a new lifestyle in the same way that black metal became a lifestyle. It might seem, on the surface, that he was unsuccessful, gaining only a couple vague statements of praise from people who were entertained by, but hopelessly misunderstood his artwork. Yet his ideas have not gone unappreciated by at least this one humble reviewer, who was permanently changed by such works, despite its reputation (or lack thereof). The second song, Keiser av en dimensjon ukjent continues the journey into this secretive fantasy world. The English translation is "Emperor of a Dimension Unknown," and it certainly suggests the feeling of a god, using the intellectual tools granted to us humble apes in the age of modernity, to escape the painful world we live in by creating a new one. Outsiders across the globe create their own lands in D&D games, in writing, in thought, but does anyone recognize how profound this is? We are monkeys, yet we can imagine alternate dimensions. Mortiis revels in that idea, and provides a soundtrack for his listeners to meditate upon their same power, to view the fruits of their imagination (assuming the medieval fantasy is relevant to their creativity, which for most nerdy white males it will be). The music is about another world. If one does not have the power of imagination to summon forth in their minds the image of an alternate dream-dimension then they can never hope to understand this music. This music is about atmosphere, and those who listen for atmosphere alone are a rare breed, requiring a certain level of imaginative force that would probably hinder them in day-to-day life: a spiritual sense of the fantastic that would send them fleeing from the real world into one more beautiful (even if it is significantly darker). Dungeon synth is not for the common man. This is not something you hear once and simply understand; this is a whole universe of unique thought. Mortiis did not make this to earn fame or money, he made this solely for himself. But for those who can share such a vision, it is a masterpiece of indescribable profundity. Keiser av really is a great album.